Installing the green roofing modules are really simple, just apply the included protective fleece over the existing roof surface and lay the green roofing modules as desired. 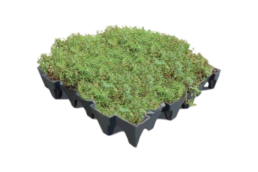 Our ground covering alpine sedum modules grow to a maximum height of approx 30 mm and do not require cutting and need very little maintenance. Our green roofing kits are stacked and palletised for transport and can be on site within 3 working days using specialist transport providers. Green roofs offer a huge range of benefits: ecological, energy saving, architectural and visual, yet can be so easy to install and maintain. They can be small scale and domestic, pitched or flat, planted with herbs, sedums and wildflowers or large and extensive, turfed with grasses for recreation or as high level urban parkland. Allbase green roofing modules, made for use with our fibreglass roofing systems are the ideal way to install a cost-effective lightweight green roof without the expense of employing specialist tradespeople and complicated layers of build-up. 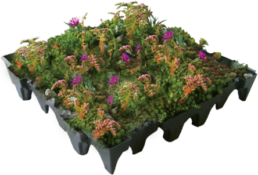 Simply lay the fully established sedum or wild flower modules to your existing surface for a satisfying long-term green roof. Our green roofing modules use nature to regulate a buildings temperature, keeping structures cooler in summer by absorbing the heat and warmer in winter by preventing snow and ice build up on the roof. Adding a green roof to your garden can massively increase the habitats available to birds and insects. Specific plant mixes and features such as log piles, rocks, bird baths, insect hotels and even bee hives can be incorporated to boost the ecological impact to the area. Lack of plants in urban areas leads to a concentration in polluted air but green roofs offer an ideal space to incorporate plants helping to purify the air and absorb polluting particulates. A green roof acts as a natural sound barrier to your roof and can help absorb up to 30% of noise pollution, providing a quieter environment inside the building. The lightweight modules easily clip together using a special coupling system and are made from 100% recycled materials. The vegetation is delivered pre-grown with up to 12 varieties of sedum, while the wildflower version can have up-to 30 additional varieties of wildflowers and meadow grasses. 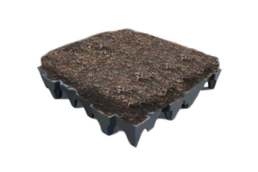 Our kits contain everything you need to create your own living green roof, simply choose one of the three available green roofing modules below with roof guards and stones available as optional extras. 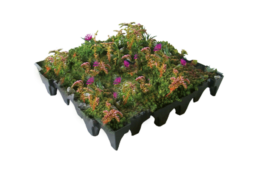 This green roofing module comes pre-grown with a mixture of Sedums and small wild flowers to provide maximum bio-diversity. This module is filled with intensive substrate and wild flower seeds. Plants will grow seasonally to provide colour.